A series of blood tests called a liver function test (LFT) can help diagnose and gauge liver damage or disease in the body. A liver function test assesses liver performance. This is measured by detecting specific enzyme and protein levels in the blood. A LFT can also measure the levels of waste products,such as bilirubin, that may be present in the blood as a result of a liver condition. A liver function test is not 100% conclusive. Certain conditions unrelated to the liver can produce abnormal LFT results. Similarly, individuals with liver disease or liver damage may receive normal results on a liver function test. Abnormal LFT results are somewhat common. It is always important to take steps to determine the cause of an abnormal LFT. This is an enzyme that helps the body metabolize protein and is found in the highest amounts in the liver cells. Liver damage can cause the release of ALT into the bloodstream. ALT is more specific to the liver than other enzymes; therefore, elevated test results can help a doctor discern the amount of inflammation in the liver. 10-40 International Units per Liter. AST is an enzyme that helps metabolize certain amino acids in the liver, as well as those in the heart, kidneys, pancreas, and muscle tissue. AST is normally foundin low levels in the blood. When the liver, heart, or other body tissue or organ is damaged, elevated levels of AST are present in the bloodstream. The amount of excess AST in the blood can help a doctor determine the extent of damageto the liver or other organs. ALP is an enzyme made primarily in the liver, but also produced in the kidneys, bile ducts, andespecially the bones. Damaged liver cells can cause elevated ALP levels, but so, too, may many unrelated conditions. These conditions include vitamin D deficiency, certain bone diseases, hyperparathyroidism,or even pregnancy. Additionally, certain medications can influence the amount of ALP found in the blood. Sometimes a doctor may ask you to stop taking medications before a test. Never stop taking any medication without first consulting your doctor. This list is not exhaustive. Be sure to discuss all medications that you take with your doctor. High levels of ALP are often found in children experiencing a growth spurt, as well as in pregnant women. Albumin is a protein made in the liver;it is responsible for fighting infection and for regulating stable fluid pressures in the body. Normally, a consistent level of albumin and total protein is found in the bloodstream. It could be an indication of liver damage or disease if albumin and total protein in the blood drop below normal. A lack of albumin may be caused by malnutrition, diarrhea, iron deficiency, infection, third degree burns, autoimmune disease, or gastrointestinal malabsorption. Bilirubin is the naturally occurring by-product of the breakdown of red blood cells. Bilirubin gives bile its yellowish color. Old red blood cellsare replaced by new red blood cells daily; once old blood cells have been removed, bilirubin remains. The liver breaks down bilirubin in order to allow its removal via the stool. Bilirubin is responsible for giving stool its color. Jaundice occurs when too much bilirubin enters the bloodstream. Gamma-glutamyltransferase is an enzyme found in the liver and other bodily tissues and organs. GGT plays an important role in transferring amino acids and metabolizing the antioxidant glutathione. Higher than normal amounts of GGT in the blood may be an indication of liver or bile duct damage. If GGT levels exceed 100 IU/L, your doctormay examine other enzymes to ascertain possible causes of liver damage. 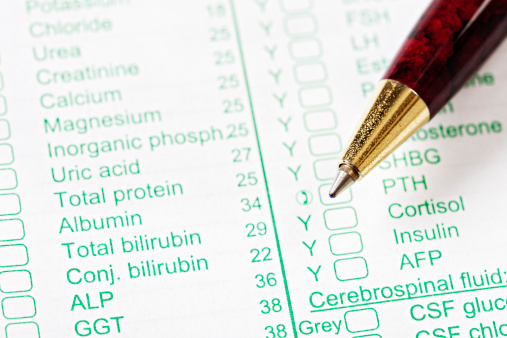 Some healthy individuals may have a GGT score of up to 120 IU/L. L-lactate dehydrogenase is an enzyme found in the liver and other bodily organs and tissues. Elevated levels may indicate liver damage. Prothrombin time is the time it takes for blood to clot. An increased PT time may indicate liver damage. Blood thinning medications and estrogen-containing medications such as birth control pills and hormonal replacement medications can affect a PT result. 11-13.5 seconds, if individual is not taking blood thinners. Proteins are classified as either albumin or globulins. The globulins will increase with inflammation. *"Normal Ranges" are not normal for everyone and should not replace information providedby a doctor. Please note that individual lab reports may contain different parameters.